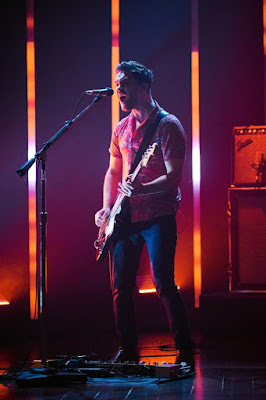 Royal Blood performed their current US single, “I Only Lie When I Love You”, on CBS-TV’s The Late Late Show with James Corden on January 16 and video from the program is streaming online. The song is the second track issued from the sophomore effort, “How Did We Get So Dark?”, which debuted atop the UK charts upon its release last June to duplicate the success of the band’s 2014 self-titled record, the fastest-selling British rock debut album in their native country in three years. Bassist/vocalist Mike Kerr says that he and drummer Ben Thatcher experimented with new sounds and techniques for their second studio effort. "One thing we learned,” Kerr tells the BBC, “is we have quite a delicate sound and once you add things - the wrong things - our whole sound sort of shrivels. Or it capsizes and it doesn't sound like us anymore. We've realized a lot of the identity of our music is when me and Ben play together. "Even the backing vocals - we did try having girls come in and sing, but it just didn't work. It had to be my voice. It had to be just about me and Ben." Following a tour of Australia and New Zealand that begins in late April, Royal Blood will launch a spring US headlining trek in Brooklyn, NY on May 28.